When Huntsville residents wake up Friday morning, they will have two new favorite web sites to check. 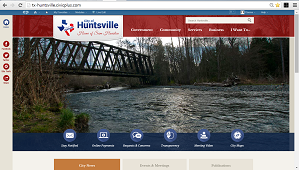 The City of Huntsville's main site at www.huntsvilletx.gov and the City's Tourism and Cultural Services Department site at www.huntsvilletexas.com will make the switch Thursday evening, June 25. "This is a great opportunity to get to know what services you can handle with the City online," noted Vasquez. "Main buttons placed prominently on the home page and accessible from all interior pages link to online payments, subscriptions and notifications, mapping tools, and video, just to name a few. With the new web sites, the City of Huntsville will be able to increase community engagement and enhance interaction between residents and their government."